The Andreanov tsunami was generated by a Mw 7.9 earthquake (51.593°N 177.588°W), 1996-06-10 04:03:36 UTC (according to the USGS). Development of this database was a joint effort by NOAA, the University of Hawaii (UH), and the Japanese Meteorological Agency (JMA). This work is part of the Early Detection and Forecast of Tsunamis Project, an effort funded by the Defense Advanced Research Projects Agency to develop the Pacific Disaster Center. FUTURE PLANS. This database and web site will be maintained for a limited time by NOAA/PMEL as an experiment. Eventually, we intend to transfer responsibility for maintaining the database to the NOAA National Geophysical Data Center. CONTRIBUTIONS. We encourage other researchers to contribute additional records of this event, in order to make the database as complete as possible. DISCLAIMER. Limited quality control was performed on the data. Obvious outliers were replaced with linearly interpolated values. Some time series retain errors and instrumental artifacts; these are most apparent in plots of the filtered time series (see below). At present, contributed records include 71 from NOAA, 58 from JMA, 33 from UH, and 4 from the U.S. Army Corps of Engineers, for a total of 166 records from 127 individual stations (some stations have multiple sea level sensors, each with a different sampling rate -- 15 sec, 1 min, or 2 min). 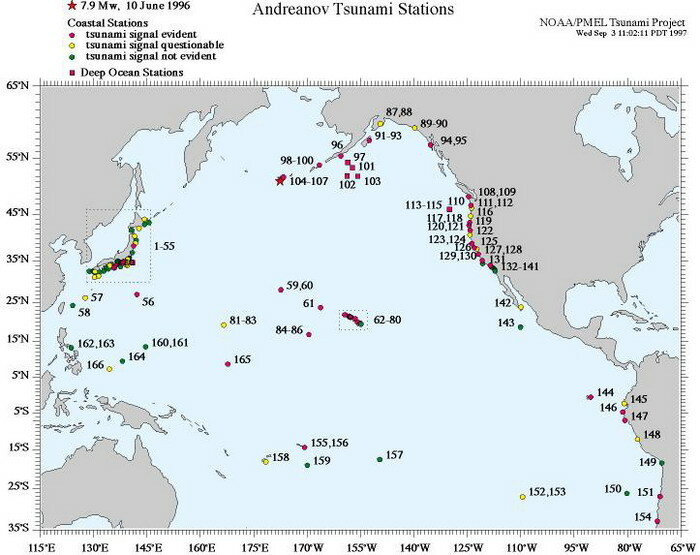 The tsunami is clearly evident at 46 stations, not present at 46 stations, and uncertain at 32 stations (additional special processing may reveal a signal); the remaining 3 stations are characterized by bad or missing data. A plot of each record and a high-pass filtered subsection, 12 hours before to 12 hours after the estimated tsunami arrival at the station, are provided here. Some editing was performed to remove obvious outliers, but a number of time series still retain errors and instrumental artifacts; these are most apparent in the filtered time series. Individual plots can be viewed most easily by first examining the Map of Station Locations, which is annotated with plot numbers (assigned somewhat arbitrarily in a north-to-south fashion), then proceeding to the Station Summary Table Sorted by Plot Number, where each plot number is also a clickable link to the plot itself (links below). A Station Summary Table Sorted by Name is also provided, for convenient reference. Please note that loading the 56 pages of Plots can take a while. Map of Station Locations (PDF) - with clickable area maps. Table by Plot Number (PDF) or Table by Name (PDF) of Available Data - with links to plots. Plots (pdf) - 56 scrollable pages with 3 plots/page. The seven NOAA/PMEL deep ocean BPR records are of special interest. Four constitute an array located south of the Shumagin Islands in the Aleutian Island chain, approximately 1400 km from the epicenter. Three more were located off the Washington-Oregon coast, approximately 3500 km from the epicenter; these three stations were located so close together that they are effectively a single tsunami monitoring station. The Alaskan array recorded the seismic Rayleigh wave as well as the tsunami. To minimize the seismic signal and better delineate the tsunami wave form, we have subjected a 24 hour subsection, 6 hours before to 18 hours after the estimated tsunami arrival times, to a 4-120 minute band-pass filter, then displayed them together with the high-pass filtered series. All data can be downloaded via FTP; the summary tables, charts and plots are also available. See FTP information.